I've had my two boys for two weeks now, Riff is doing well and climbs into my hand when its in there and likes to be cuddled and taking for rides in my hoodie so things are slowly getting there. 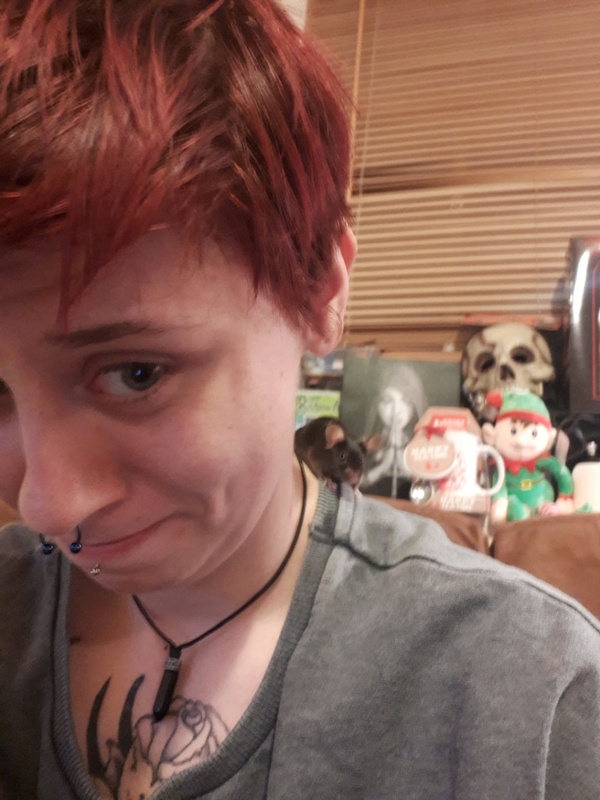 However, Toby on the other hand still seems to be scared of me, I managed to get him out of his cage yesterday which took me an hour because he kept jumping out he climbed on me and hid on my shoulder for a good 20 minutes. Since then he barely takes a treat from me and does anything he can to avoid my presence. I've been sitting next to his cage 3 times today all about half hour long even though he is in the living room which we use quite a lot. It's hard to try and bond with him when it feels impossible. Am I doing something wrong or is this just him? Don't get me wrong he sat on my hand all four paws for about a minute and then became skittish again, I'm not sure what else I can offer other than my patience. treats (sunflower seeds and the occasional peanut butter on the finger) etc. My favorite way to tame is to just sit on a chair or bed and let the mouse play around. 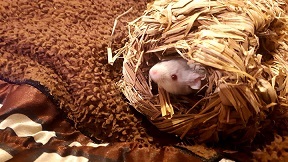 I used to have a sheet that had a small hole in it that I’d cover up with while the mice had a blast climbing all over and popping in and out of the hole. Offer yummy treats like lettuce or mealworms during and after playtime, and spend 10-30 minutes at least twice a day, at similar times if possible. It can definitely take weeks-months to get to a point where the mouse is really comfortable with you, but there have been few in my nearly 10 years of mouse-keeping who didn’t eventually come around in some way. Black mice are some of my favorite, and I love the little peaky face, so cute! @Peachy wrote: My favorite way to tame is to just sit on a chair or bed and let the mouse play around. I used to have a sheet that had a small hole in it that I’d cover up with while the mice had a blast climbing all over and popping in and out of the hole. Offer yummy treats like lettuce or mealworms during and after playtime, and spend 10-30 minutes at least twice a day, at similar times if possible. Sometimes they get comfortable with you out of the cage and then in the cage follows. If you can shoo him into a box and then use it to securely transfer him to the tub, you can play a scoop and release game safely. Scoop him up and “fly” him to another part of the tub. Keep your hands low in case he jumps out. You can use your hands to block him from going past your elbow. With this method he can’t hide and ignore you at home, and it also gets him used to your hands. @Peachy wrote: Sometimes they get comfortable with you out of the cage and then in the cage follows. If you can shoo him into a box and then use it to securely transfer him to the tub, you can play a scoop and release game safely. Scoop him up and “fly” him to another part of the tub. Keep your hands low in case he jumps out. You can use your hands to block him from going past your elbow. With this method he can’t hide and ignore you at home, and it also gets him used to your hands. It probably just needs more time. But it also doesn't hurt if you find a treat that he's particularly crazy for mine always seem to love dried mealworms and cheerios or rice crispies! Thank you both Peachy and Mouselover. I would also like to apologise on the delay of my response due to work and also working on Toby more so than Riff. I brought some cheerios and to my surprise it worked! He came right over and ate it from my hand, 5 minutes later he crawled onto my hand and ran up my sleeve, it was... so magical. Go Toby! My Yoshi loved to play in my sleeves and pop out at the neck to tickle my ears. He turned into the bestest boy that ever existed. @Peachy wrote: Go Toby! 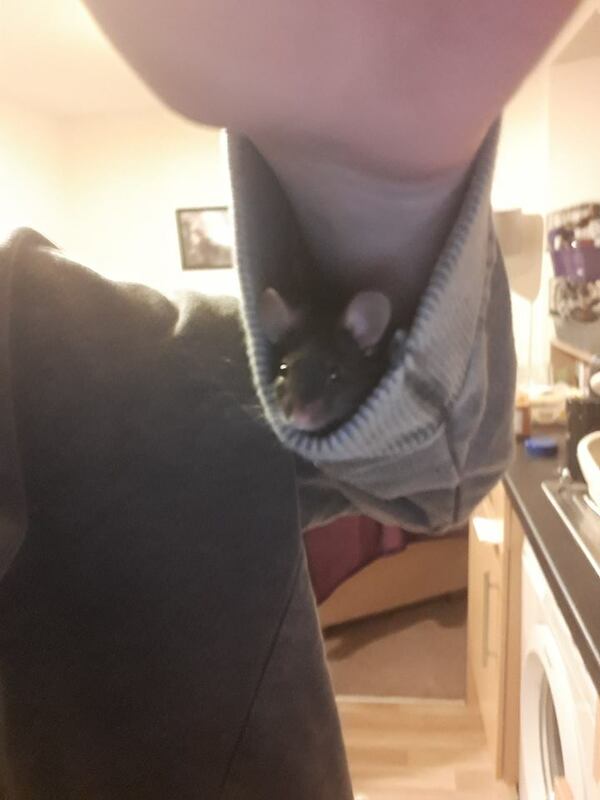 My Yoshi loved to play in my sleeves and pop out at the neck to tickle my ears. He turned into the bestest boy that ever existed. Very sweet and I'm glad you're making some progress Cheerios are such a favourite haha. The bonding process can be frustrating, but you can start making tiny gains, and eventually end up with a very tame mouse. In some ways it can be more rewarding if they're more difficult to tame, and then they end up being your best buddy. It feels like a real achievement lol. 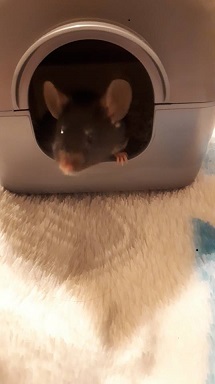 That's great that Riff always wants to come out now too I've had mice that would sit by the cage door and wait for me when they see/sense me walk into the room. So so cute.